Friday, March 17 ~ Stations of the Cross in church at 6:00 p.m.
Rev. 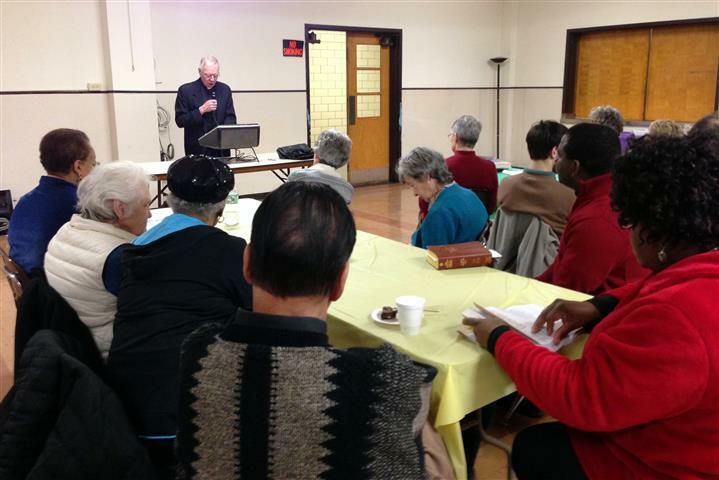 Peter Drilling was the opening speaker for our Wed. evening Lenten Program. Our parish Lenten program continues this Wednesday, March 15, with our second “simple supper” and continued insights into the meaning of “the Kingdom of God.” Our guest speaker will be Moses Ikuelogbon, a seminarian at Christ the King, now in his Pastoral Year at St. Benedict’s parish. This week we’ll be enjoying pizza, a green salad, and desserts, served from 5:30-6:30pm, followed by Mr. Ikuelogbon’s presentation at 7pm. Please remember: If you signed up to bring cookies, we’re counting on you. Our three-week program will end on Wednesday, March 22, with Prayer Around the Cross beginning at 7pm in church. 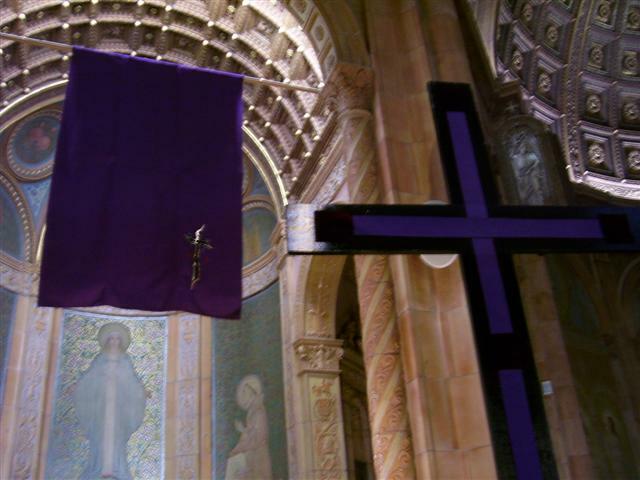 Stations of the Cross will take place in church at 6pm each Friday during Lent. Religious Education Update ~ Our religious education classes, focusing on Liturgy and Prayer, are continuing each Sunday of March from 9-9:45am in St. Charles Hall. If you have not already done so, please return your completed enrollment form to the Rectory this week. Additional forms are available at Mass if needed. We will be following the Buffalo Diocesan directives for Faith Formation and parents are expected to attend class with their children. We are in desperate need of more teachers. If you are interested in helping to teach a small group of children with planned activities, please contact Elizabeth Clay at 472-0009. Our cluster of Catholic Churches of Central Buffalo continues its tradition of Monday evening Lenten Journey Masses at 7pm. On March 13 we will be visiting Ss. Columba-Brigid Church, 75 Eagle Street near Clinton. The Parish Council meeting which would normally take place on Wednesday, March 15, has been rescheduled to Wednesday March 29 at 7pm in order to accommodate the Lenten program. Notes from the Loft ~ Our interim Music Director, Elizabeth Clay, will be away on March 12 and 19. We express our sincere thanks to Nancy Erdman for enhancing our services with her music ministry during Elizabeth’s absence. 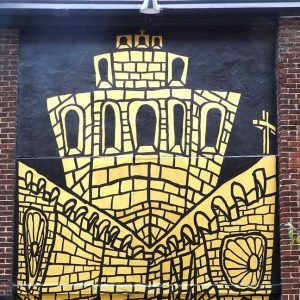 Vocation View: Second Sunday in Lent ~ On Mount Tabor, Jesus revealed a glimpse of his glory, not to show off, but to express his desire to share His glory with us. Thanks to Christ, it is this glory that we are destined for. The same Christ calls some to priesthood and religious life to show his followers how to live for this glory. If God is calling you to a Church vocation, call Fr. Andrew Lauricella at 716-847-5535. You can also check out the “Priest of the Month” stories on our website www.buffalovacations.org. “Into the Light,” an a capella performance by the Harmonia Chamber Singers takes place this Sunday, March 12, at 7pm at Assumption Church (435 Amherst Street). Free-will offering. Lenten Pierogi & Placek Sale at St. John Kanty (101 Swinburne Street) March 4 – April 9 on Saturdays 3-5pm and Sundays 9:30am-noon. Call 716-893-0412 for information. Experience the meandering path of a Labyrinth on Monday, March 13 (11am-8pm) in the Community Room at St. Joseph University Parish (3269 Main). The Labyrinth can be thought of as a journey to God, a metaphor for the inward journey. “The Story of Faith” will be presented by nationally-acclaimed performer, Frank Runyeon, on Monday, March 20, (Signs: Gospel of John) and Tuesday, March 21, (Sermon on the Mount and Hollywood Versus Faith) at St. Martha’s Church (10 French Road, Depew) from 7:00 to 8:30pm. Father/Daughter Bonding Day at Sacred Heart Academy (3860 Main Street, Eggertsville) for Dads and daughters in grades 4 to 7 will take place Sunday, March 26, from 1:00 to 4:00pm. More information at sacredheartacademy.org or 716-834-2101, ext. 311. A Concert for Laetare Sunday with Bobby Militello at St. Michael’s Church (651 Washington Street) is Sunday, March 26, at 2pm. Tickets are available at St. Michael’s rectory or in the church on concert day. More information at stmichaelbuffalo.org.